"Nama" in Japanese means "raw". 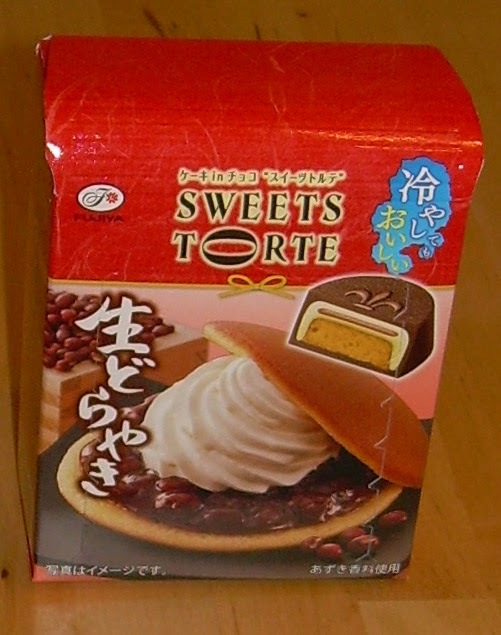 I'm guessing that the reference in this case relates to the enormous dollop of whipped cream in the center of the dorayaki in the picture as this certainly does not appear to be uncooked in any sense of the word. Dorayaki, for those who don't remember or haven't seen my reviews of such treats, is two pancake-like slabs that sandwich a sweet jam filling. The filling is usually red beans or a mixture of beans and other things like chestnuts, pumpkin, or sweet potato. I favor the chestnut ones, but the red bean ones are fine as well. I have never had one that came with a whopping pile of whipped cream, but the idea certainly holds appeal. My husband is a sugar hound and I'm a fat fiend. He'll take the heavily frosted things and I want the stuff that's slathered in whipped cream. In fact, I'm pretty sure that gelatin was invented not as a way of using bones from animals, but rather to offer a preferred conveyance for whipped cream. Gelatin as a dessert is so lame that no one would blame you for adding a little something to make it better. I believe this is also the reason people invented "Jell-O shots". Knowing that you are getting intoxicated makes it feel more worthwhile. Getting back to this candy, I've reviewed a few of the Sweets Torte line before and am very likely to review more in the future. The concept is to recreate a particular confection and offer up both the flavor and texture elements of the food being imitated. It's done using multiple layers of chocolate, jammy fillings and cookies. The possibility that you're going to get something special is pretty good, but there's no guarantee. 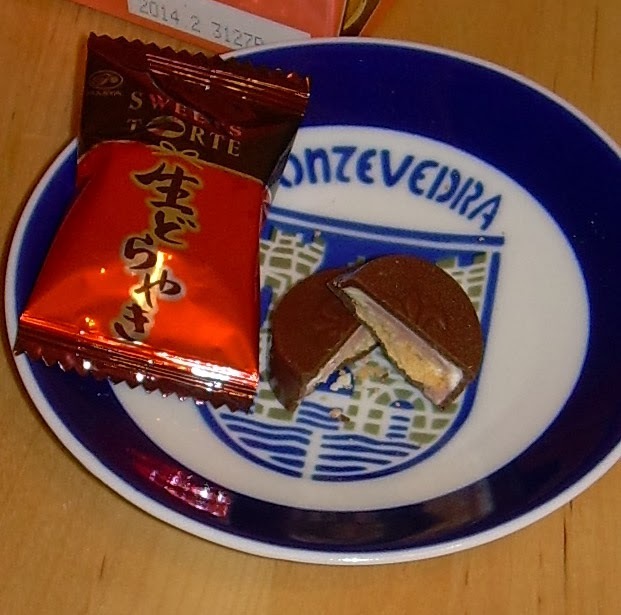 The first bite reveals most of the anko (sweet bean paste) notes that you've going to get before the sweet and rather soft chocolate flavor merges in and dominates. The cookie base is slightly crispy, but not as brittle as other versions of this that I've tried have been. The flavors don't reveal themselves in layers so much as in a melange which is mainly overwhelmed by milky bittersweet chocolate. I don't get any sense of the flavor or texture of a dorayaki-style pancake at all. That is where the biggest disappointment comes from. If that is not present in some fashion, then this is just really a mildly adzuki-tinged chocolate. It's actually pretty tasty, but only if you're looking at this as a chocolate and not as something which is supposed to be unique. I paid around $2 (200 yen) for this small box with five candies about the size of a very large coat button. In terms of value for the experience, it's a very bad buy. So, while I can say I will be more than happy to eat the rest of these, I would not buy it again as it's just not special enough for the price.